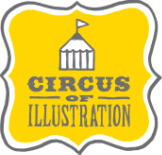 Welcome to the Circus of Illustration’s second zine - a collection of original artwork by a merry band of professional illustrators and creative individuals based in the Bedfordshire area. We are passionate about what we do, and, perfectly in time for summer, this zine has been inspired by the theme of water. We have a limited amount of printed zines available. If you would like to purchase one please visit our shop. To download your own low resolution copy please click the link opposite. The PDF has been created as double page spreads. Each spread will fit on to an A4 sheet of paper. Alternatively you can view it online below.